Over-portioning is a significant source of food waste. By controlling portioning, food service establishments can save a substantial amount of annual operating costs. 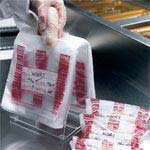 Day-of-the-Week Portion Bags are designed to reduce costly food waste while assisting in proper food rotation procedure. 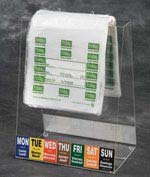 Day-of-the-Week Portion Bags include space for marking portions with necessary food rotation information and are equipped with a flip-lock top for safe storage.